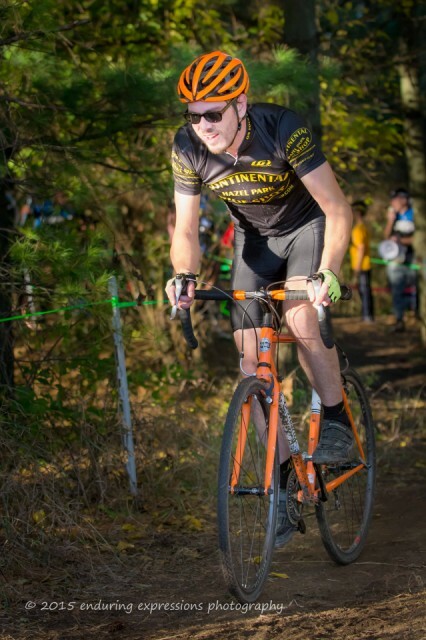 Daughter Laura's boyfriend Thomas is captured emerging from the woods portion of a Chicago Cross Cup amateur cyclocross bicycle race at Campton Hills west of St. Charles, Illinois. Cyclocross races include obstacles, and a log across the dirt path awaited Thomas at the transition to a grass surface. This is a 30 minute race. I believe I heard the announcer say that cyclocross originated in Europe.